2DGalleries - Independent community website dedicated to Comic Art collectors and enthusiasts. Albert Moy - Original comic art. Bill Cole Enterprises - Your source for all your comic storage needs, from polyethylene bags to mylar sleeves, acid free boards and boxes. Book Palace, The - Thousands of new and used books on popular culture, illustration art, film, TV, graphic novels, newspaper strips, comics & annuals, pin-up and glamour books, and reference books, including science fiction, fantasy, horror, crime, children's and rare books. Plus original art, prints, posters, figurines and original comics. Cartoon, Character and Comic Collecting - From About.com. Collectorz - Catalog your comic collection, including all comic data (series, title, issue number, publisher, publication, date, creators, characters etc.) and of course the front and back cover images. Comic Book DB - Goal of this project is to catalog every comic, graphic novel, manga, creator, character and anything else that could possibly relate to the field of comics. Comic Book Plus - The original and still the premier site to legally read and download Golden and Silver Age comic books. DC Comics - Home to Batman, Superman, Wonderman, and many other long-running favorites, as well as small-circulation lines of more innovative fare, DC has been running since the 1930's. Marvel Comics - Home to Spider Man, the X-Men, the Hulk, Fantastic Four and more. Top Shelf Productions - Publishes contemporary graphic novels and comics. The Top Shelf library is anchored by such masters of the craft as Alan Moore (From Hell, with Eddie Campbell; Lost Girls, with Melinda Gebbie), Craig Thompson (Blankets), Andy Runton (Owly), Jeff Lemire (Essex County), Jeffrey Brown (Clumsy, Unlikely), Alex Robinson (Box Office Poison), James Kochalka (Superf*ckers, Johnny Boo), Matt Kindt (Super Spy), Nate Powell (Swallow Me Whole), Robert Venditti (The Surrogates, with Brett Weldele), Renee French (The Ticking), and many more. ComicBase - Software for managing comic collections. Other Links: Links to comics information on the Internet. Entries are cross-referenced into the main bibliography pages. Excalibur Comics - Portland, Oregon comic book store, co-owned by Debbie Smith and her father, Peter Fagnant. Four Color Comics - Comics and posters. Golden Age Comics - UK site for downloading copyright free golden age comics. Grand Comic-Book Database (GCD) - An all-volunteer online effort to catalog every single comic book ever published in a simple text-based format. Its intention is to catalog key story information, creator information, and other information useful to readers, fans, hobbyists, researchers. Graphic Collectibles - Collectible comic art and original comic book art. From comic art sketches and comic art paintings to vintage movie poster art and limited edition art prints, Graphic Collectibles represents several comic book artists exclusively, including Tim Sale, Bill Sienkiewicz, Joe Chiodo, Bob Larkin, Jeff Scott Campbell, Ed McGuinness, Howard Chaykin, Brian Stelfreeze and others. Heritage Auction Galleries - Vintage comics and comic art. Illustration Art Gallery - Shows the world of illustration art, including original artwork for comics (comic books) and annuals, book covers and illustrations, graphic novels, magazines, film animation cels, newspaper and comic strips, poster art, album cover art, superb fine art reproductions and high quality art prints. Illustration House - Thousands of oil paintings, drawing and watercolors cover a broad range of styles, genres (including poster design, books decoration, advertising, comic strip, calendar art, record album and magazine covers) and subjects - science fiction, romance, history, suspense, fairy tales, pin-ups, humor and fashion, to name a few. 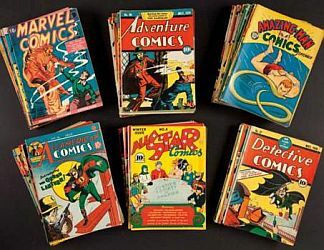 Metropolis Collectibles - Vintage comics of the highest quality, with over 100,000 golden age and silver age comics. Monster's Collectibles - Original comic art. My ComicShop - Comic books from Batman and Superman comic books to Spiderman and X-Men comics, new and back issues. Buy, sell, trade, consign, collect. Sequart.com - Comic books, graphic novels, sequential art, manga news, reviews, and resources. Steve Krupp's Curio Shoppe - Specializes in original cartoon and comic strip art, books and graphic novels, comic books and comic related merchandise and collectibles from such legendary artists as Will Eisner, Harvey Kurtzman, Milton Caniff, Ernie Bushmiller, Al Capp, Russell Keaton, and R. Crumb, as well as the contemporary talents of Peter Poplaski, Charles Burns, Howard Cruse, Alan Moore, Eddie Campbell, Mark Schultz, Kellie Strom, Frank Stack, Jack Jackson, and James O'Barr among others. TradeReadingOrder - The database is the heart of the site, unique in its ability to dynamically generate accurate reading order lists for thousands of characters, events, and even entire publishing universes. This webpage last updated on Monday, January 21, 2019 12:29 PM.